The Boston Bruins finally broke the pattern of statistical anomalies which ran rampant in this series, and defeated the Vancouver Canucks 4-0 in Game 7 to capture their first Stanley Cup championship since 1972. Vancouver netminder Roberto Luongo, who on the road in this series, had been lit up for 15 goals in 3 games, but had given up only 2 goals in the three games played in Vancouver, finally ran out of luck. The former Canucks’ captain ended the series by curiously giving up 18 goals in his last five games played. His Canucks had a three games to two lead in the series, but he gave up 3 goals on only 8 shots before being pulled in Game 6 in Boston, and then came game 7. 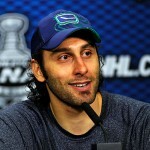 It has been said for years that Luongo needed to win a Cup to silence his critics. In light of what just occurred, he not only did not silence them, but if it turns out that he did win the Vezina Trophy (for which he and Tim Thomas are Finalists, along with Pekka Rinne of Nashville), it will be open season on the man they call “Bobby Lu”. In this series, He had folded like a lawn chair on the road, but was unbeatable at home, except when it mattered most, but He does not deserve all the blame. The high powered Canucks offense, which led the entire NHL in regular season scoring, managed only 8 goals in the Cup Final – one goal less than Boston scored in Game 4 alone. Henrik and Daniel Sedin were definitely less than spectacular, and they too will face plenty of criticism and skepticism next season. Daniel is a Hart Trophy (regular season MVP) finalist. If he wins the Award, he may have to go into hiding. Henrik won the Award last season. 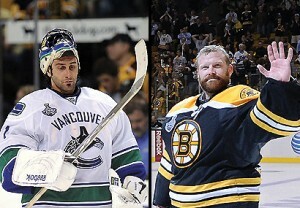 Boston Goalie Tim Thomas took home the Conn Smythe Trophy for Playoff MVP. Thomas can now hold his head up higher than ever, and keep flashing his infectious smile. This was his third Game 7 win of this postseason. He was again stellar when it mattered most, that is what big time playoff goaltending is all about. He now also has 2 of 3 Awards needed for the trifecta (Stanley Cup champ, Conn Smythe Trophy, and Vezina Trophy). He may well be awarded trophy number three, exactly one week after having garnered trophies one and two. Had the Canucks managed to win this Game 7, this series is one that would have been debated by fans, and analyzed by the media, for years to come. Boston fans would have pointed out that their team outscored the Canucks 19-8 coming into Game 7, Tim Thomas was probably still the playoff MVP, and their beloved Bruins were simply robbed by the fickle finger of fate. Canucks fans would have argued their team had the best record during the regular season, and were favorites going into the series, so through out all the stats you want. Our team won, winning needs no further explanation. As it stands, it is all moot. The Bruins ultimately outscored Vancouver 23-8 in the series, including a shutout in Game 7, and their goalie was deservedly named playoff MVP. All due respect, of course to the hard working Bruins’ forwards, and Zdeno Chara playing rock steady on the blueline. There is no debate to be had. The team that played better in the series, won the series. End of story. Congratulations to the Boston Bruins, Stanley Cup Champions 2010-11. Only thing left now, is to find out if Tim Thomas or Roberto Luongo has also captured the Vezina Trophy, or if Pekka Rinne of the Nashville Predators has stolen their thunder. As mentioned, Daniel Sedin may also be presented with the Hart Trophy that evening. Corey Perry of the Anaheim Ducks, and Martin St Louis of Tampa Bay are he other two MVP finalists. To be revealed at The NHL Awards Show in Las Vegas on June 22nd. This entry was posted in Advertisements, NHL and tagged boston, bruins, canucks, cup final, hockey, Inside Sports, luongo, NHL, stanley cup, tim thomas. Bookmark the permalink.